Looking for the best Summer BBQ Venues in Dublin to book this year, check these out. We’ve outlined some of our favourite barbecue and garden party spots below with some information on their summer BBQ parties and packages to suit all. Ideal for treating staff during the year as a corporate evening event or team building event, and equally perfect for relaxed friend get-togethers or wedding day-after parties in the sun. We strongly advise booking well in advance to get your preferred date, particularly if you require a Friday night as these usually book up first. The Sandymount Hotel on Herbert Road, D4, has probably one of Dublin’s biggest outdoor terraces, complete with marquee to ensure that your event can go ahead whether the sun is splitting the rocks or that thing we don’t like happening might happen…rain. Capacity wise it can hold up to 250 guests and the space is actually open for BBQs all year round. There is also use of a private bar should the weather not play ball. The private landscaped gardens provide the perfect setting for a summer’s evening. The BBQ menu includes everything from grilled chicken fillets and burgers, to salads, deserts and more. Packages are priced at €26.95pp, based on minimum numbers of 50 guests. Dtwo on Harcourt Street, Dublin 2 has their ‘Backyard BBQ’ open all year round serving some of the best BBQ food in town. During the summer is really when this huge outdoor beer garden and seated area comes to life and is spacious enough to hold even the largest of BBQ parties, whether for corporate team building events and evenings or other celebrations. Package pricing with drinks options available, details to follow. Ballsbridge Hotel on Pembroke Road in Dublin 4 is only minutes from the city centre. Every year they roll out the green carpet onto the sun soaked terrace outside their Dubliner Pub and serve up the most delicious BBQ food and drinks. They offer exclusive hire for for corporate events and team building evenings, as well as shared evenings for after work get togethers. The terrace is adjacent to a private function room which can be used if the weather requires it or for later in the night. Being a hotel, overnight accommodation can be arranged also if needed, with special pricing for guests. The Trinity City Hotel on Pearse Street, Dublin 2 has a fantastic outdoor courtyard and stunning terrace. Ideal for those sun drenched days and for summer BBQ parties. Whether a friends get-together or a work / corporate evening their chefs will cook up some delicious BBQ food while you relax with a drink in plenty of space and sunshine. The courtyard, combined with indoor space should the weather take a turn, is one of the largest BBQ spaces in Dublin, suitable for up to 250 guests. BBQ menus start at only €23.95pp based on a minimum of 30 guests. For smaller BBQ parties of up to 60 guests the Brunswick Terrace is also available. This terrace is sheltered and offers a relaxed intimate atmosphere with comfortable seating and tables. It’s hard to find a better spot in the city to enjoy a summer’s day or evening than FIRE on Dawson St, Dublin 2. The stunning terrace overlooks the Mansion House’s outdoor garden and gets plenty of sun. The terrace is conveniently located just outside the lounge so that should the weather change the party won’t stop! On offer is delicious BBQ food as well as a range of refreshing cocktails such as a champagne mojitos to wash it down with. Minimum guest numbers of 60 guests required. Searsons on Baggot Street, Dublin 2 are a very popular venue for all types of events, parties and being near the Aviva; match days of course. To the rear of the venue is a truly spectacular beer garden for Summer BBQs. Available for exclusive private hire this unique space is one of Dublin’s best sun traps and can accommodate up to 100 guests for summer parties. It comes complete with its own private bar and toilets. and a retractable roof, fully heated all year round, should the weather require it or for BBQs outside the summer months. For those located in or near Smithfield, Dublin 7, Christophe’s is a hidden gem. On the Luas line and located on the same courtyard, directly opposite the Jameson Distillery this venue opens for private summer BBQ evenings on request. With an outdoor heated terrace, tables and seating you’re sure to soak up the sun in style. Packages from €22.95pp including tasty options such as Hereford beef burgers, Clonanny farm black pepper sausages, roast vegetable skewers to name but a few and a selection of salads and homemade breads. Every summer The Odeon in Dublin 2 lay on one of the best BBQ parties around. 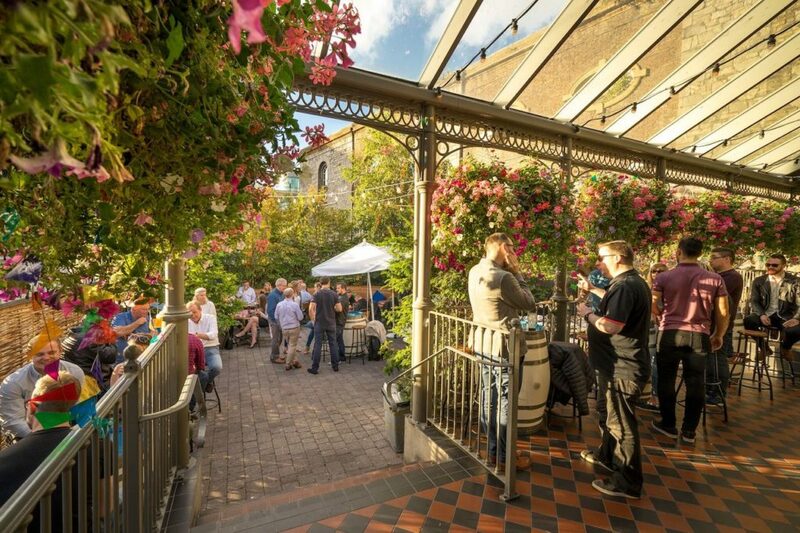 Their beer garden adjacent to the venue is a serious sun trap and its central location at the Harcourt Street Luas stop make it a super popular choice of summer BBQ venue. Seating and areas can be reserved in The Odeon itself or for larger groups and more exclusivity, the private function room; The Bourbon Bar above The Odeon can also be reserved. Promotions include a BBQ item and drink (beer or prosseco) for only €10. Sunny summer evenings in Ely Bar & Grill are a real treat. Ely is located in the CHQ Building on Dublin’s docklands and within easy reach of the city centre. With a waterside outdoor terrace and bar, and its infamous reputation for food and drink you can be assured of some of the finest BBQ food and libations Dublin has to offer. Custom packages available, please enquire for more information. I don’t think anywhere quite catches the sun as well as Johnnie Fox’s beer garden on a fine summer’s day. Being perched in a prime position on the Dublin mountains definitely helps I’m sure though! Only a few minutes drive from South Dublin and with an express bus service from the city centre this is certainly one of the spots you’ll find us this summer 😉 The Haggart is Johnnie Fox’s outdoor beer garden area, and comes complete with a marquee covering if the rain should try dampen the spirits. The area is heated also if needed to allow for extra late summer evening get togethers, with live music to top it off of course. For those on or near the south side of Dublin, Union Cafe will be hosting regular barbecue parties at their Mount Merrion venue. Perfect for local businesses and people in the area. Perched high above the neighbouring houses, Union Cafe offers stunning views over the city and it’s sure to be a popular spot come the summer. Please enquire for more information.